> Can an SUV become a race car? Lamborghini proves it's possible! It's time to bring in the beast. The ST-X is not your usual Huracan GT3 race car. 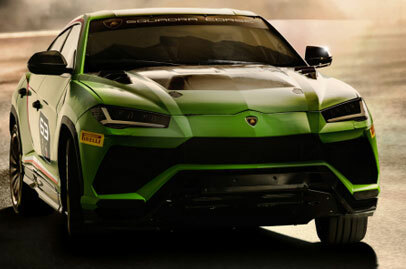 In fact it's a souped-up version of the Urus SUV making it more than worthy to hold the Raging Bull emblem. Based on the Urus body style it gets a new-look front end with much larger air intakes that help improve the cooling in the engine bay. Low and wide the ST-X sports a more menacing stance with aggression that isn't usually associated with the SUV body type. Look closely and you’ll spot hexagonal exhaust tips under the rear doors. Designers also added a roof-mounted spoiler for additional downforce, a full roll cage, and 21-inch, center-locking alloy wheels wrapped by Pirelli tires. The result is a grocery-getter that can fend off purpose-built sports cars during a morning track session, and drift around a dirt course like a rally car in the afternoon. The ST-X will do both; Lamborghini designed it for on- and off-road racing. The carbon fiber hood hints at the effort Lamborghini’s research and development department put into shedding as much weight as possible. Though it didn’t provide specific figures, the Italian company noted its engineers made the ST-X about 25 percent lighter than the regular-production Urus, which tips the scale at roughly 4,800 pounds. Lamborghini will reveal the changes it made to bring the ST-X’s weight down to approximately 3,600 pounds in the coming months. It sounds like the ST-X keeps the Urus’ twin-turbocharged, 4.0-liter V8 engine. Chosen for its torque, the eight-cylinder makes 650 horsepower and 627 pound-feet of torque. It spins the four wheels through an eight-speed automatic transmission. Talk about a super SUV! Lamborghini should simply focus on building supercars. The SUV looks nowhere here nor there.